A squirt of water makes most people squeal. And after squealing, what else is there to do but laugh at your loss of dignity? And so Songkran, the Thai new year that seems to be an excuse for a national three-day water fight, is a very happy time. In Chiang Mai, particularly near the moat that borders the old part of town, the streets have been full of happy faces, drenched shirts and all manner of plastic water shooting and throwing devices. The local government announced last week that the moat had been cleaned. I thought it quite a strange news item until I realised that during Songkran, people use the moat water as ammunition in their water fights. Even the “clean” moat water has a peculiar smell. I have been concentrating very hard on keeping my mouth shut when under fire, even though a happy open-mouthed squeal is the most natural reaction to a squirt of water from a water gun, a powerful stream from a vacuum-propelled supersoaker or the good old fashioned bucketful of water. The squeal is more of a shriek when the water is cold! Songkran goes a little way towards explaining the preponderance of pickup trucks in Chiang Mai. For the water festival, it seems every pickup truck in Chiang Mai (and there are A LOT) is loaded up with a couple of huge water barrels and as many people can possible fit in the tray. And then the trucks drive around town throwing water on people in other trucks. And people on motorbikes. And the people who have set up water-throwing stations outside their houses. The local government encourages the water fun with public filling stations and water sprayers set up along the city’s main bridge across the Ping River. There’s a whole array of Songkran accoutrements, and a whole array of business people supplying the goods. There’s brightly coloured water guns and water pistols for sale everywhere. Along the moat, there’s people selling buckets and string, to haul water from the newly-cleaned moat. There’s also people selling giant blocks of ice, to place in the water barrels so that it’s not just water that’s dumped or shot at passersby, it’s icy cold water, sometimes with added menthol for extra icy-ness. There’s also people selling clear plastic cases for mobile phones and purses, which can be worn around the neck. In some parts of Chiang Mai, Songkran is a tourist event. Scantily-clad Western tourists do battle with water, retiring to drink beer and discuss their conquests. We did a few passes through the tourist areas on our motorbike, but I found the local water fights so much more fun. And the Thai people were so gentle when they realised we had a toddler on board. She did get a few buckets of water dumped over here and a few streams from powerful super-soakers. But most people were very careful with her, spraying her legs, or just throwing a handful of water in her direction. And she LOVED it. She kept calling for more water, even when she was shivering. 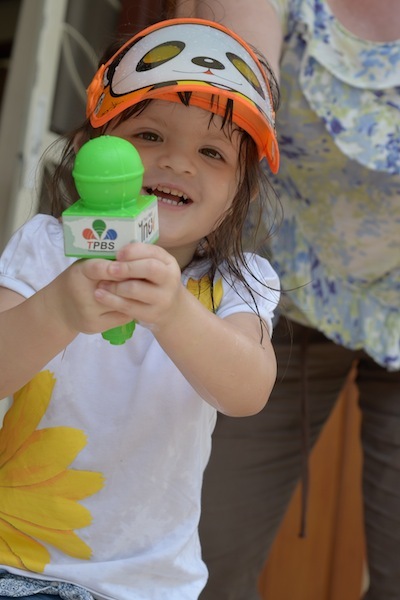 We were not brave enough to take our camera into the fray, so the only pictures we can offer is of Miss M, who managed to break three water pistols and lose her face mask in the days leading up to the water festival. 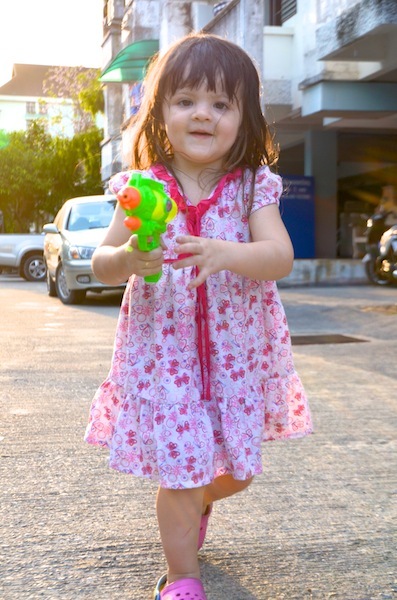 She went into battle with just a 25 baht water pistol from the local Tesco Express and a trigger finger that wasn’t strong enough to hit many targets at all. The highlight of Songkran to me was the sight of gleeful grandmas shooting sprays of water from the back of pickup trucks. So after several forays around town, Darling Man, Miss M and I are well and truly washed clean and ready for the new year. Happy Thai new year from our little family to yours, wherever you are in the world. P.S. For the most amazing pics of the Songkran festival in Chiang Mai, check out Canvas of Light by the brilliant (and lovely) Chiang Mai-based photographer Daniel Nahabedian.